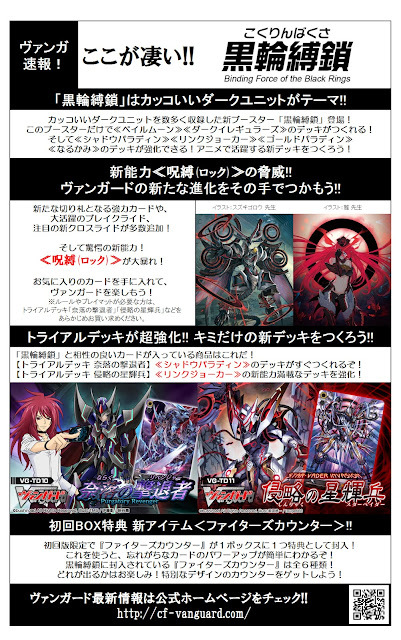 The set will contain 102 types of cards with 1 reprint, currently believed to be Blaster Dark Revenger from TD10:Purgatory Revenger. It will also support the Pale Moon, Dark Irregulars, Narukami and Gold Paladin clans. Careful scrutinizing of the promotional images reveals cards resembling Great Silver Wolf Garmore, Divine Seal Dragon Dungaree and Mad-Eye Basilisk. The Link Joker units have been noted to resemble existing units from other clans, so far with Blaster Blade on the cover image for TD11, Spectral Duke Dragon on one promotional image for BT12, and Silver Thorn Dragon Tamer, Luquier on the other promo image. Furthermore, the artists for these Link Joker units are the same as their originals, Suzukigorou and Masa. Notably, as the images for the Garmore and Dungaree lookalikes have United Sanctuary and Dragon Empire nation boxes, it appears that modern promo materials are now eschewing the standard practice of using Sanctuary templates to conceal a unit's nation prior to release. Because of this, the image for TD11 which showed a US nation likely points to Link Joker being from the United Sanctuary. However, due to now counting a version of Luquier among its ranks, Link Joker may be a composite clan with multiple nations contributing to its card pool. In addition to the new "Lock" mechanic, the image at left advertises that BT12 will also introduce new crossride and break ride units. 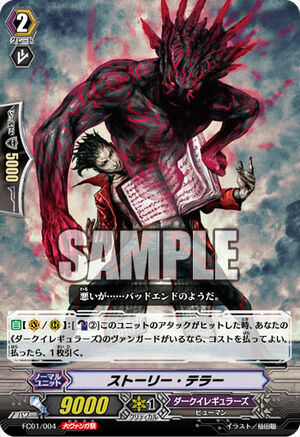 With Garmore and Dungaree as the speculated crossride candidates, and the Link Joker clan which is already embraced by many cardfighters as an appealing new group of antagonists, BT12 is shaping up to be one of the most anticipated sets of 2013. 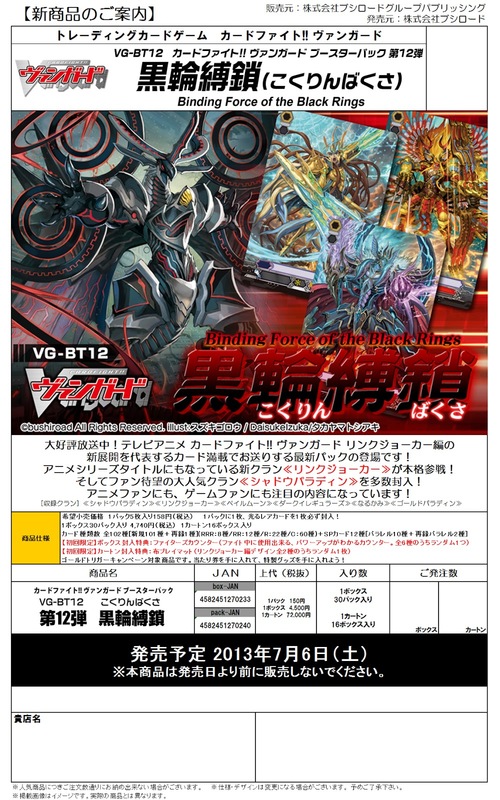 [AUTO](VC) Limit Break 4 (This ability is active if you have four or more damage):[Soul Blast (3)] When this unit's drive check reveals a grade 1 or greater «Genesis», you can pay the cost. If you do, put that revealed card into your drop zone after of this drive check, and perform a additional drive check. 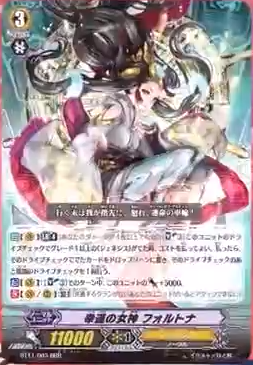 [AUTO] Limit Break 4 (This ability is active if you have four or more damage):[Counter Blast (1)] When a «Genesis» rides this unit, you may pay the cost. 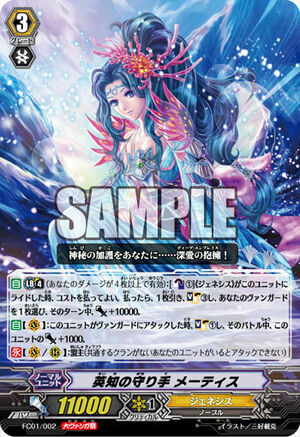 If you do, draw a card, Soul Charge (3), choose one of your vanguards, and that unit gets [Power]+10000 until end of turn. [AUTO](VC/RC):[Counter Blast (2)] When this unit's attack hits, if you have a «Dark Irregulars» vanguard, you may pay the cost. If you do, draw a card. [AUTO](RC):[Counter Blast (1)] When this unit's attack hits a vanguard, if you have an «Bermuda Triangle» vanguard, you may pay the cost. If you do, return this unit to your hand, choose up to one «Bermuda Triangle» from your hand other than a card named "Pretty Celeb, Charlotte", and call it to an open (RC). 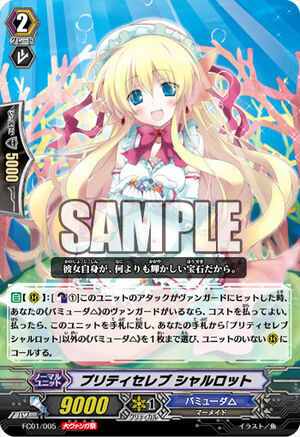 [AUTO](RC):When this unit boosts a «Neo Nectar», if you have a «Neo Nectar» vanguard, and if your deck has been shuffled by your card's effect during this turn, the boosted unit gets [Power]+3000 until end of that battle. 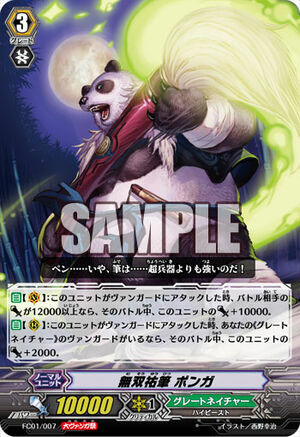 [AUTO](VC):When this unit attacks a vanguard, if the [Power] of your opponent's battling unit is 12000 or greater, this unit gets [Power]+10000 until end of that battle. 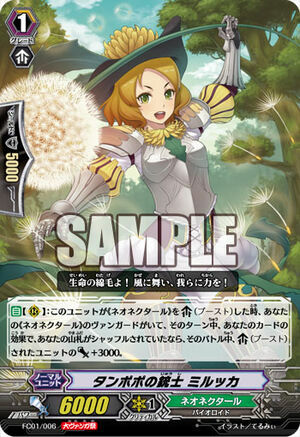 [AUTO](RC):When this unit attacks a vanguard, if you have a «Great Nature» vanguard, this unit gets [Power]+2000 until end of that battle.